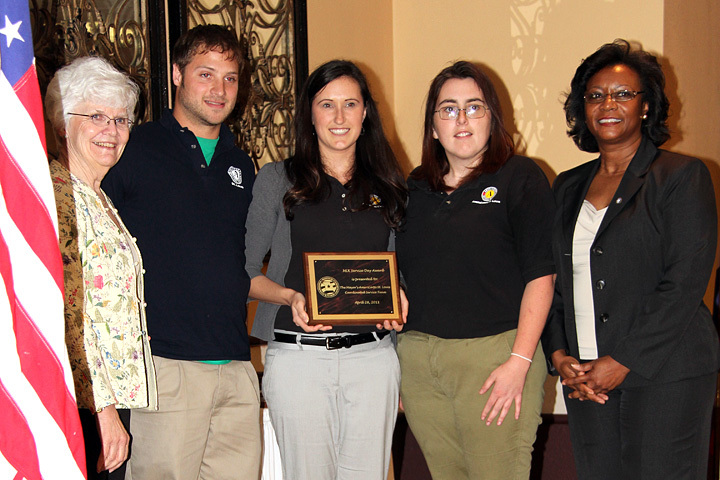 AmeriCorps St. Louis Members is proud to have received three awards. Second-year Emergency Response Team Members Emily Woodruff and Will Burks both received an AmeriCorps State Service Award, which recognizes individuals who have demonstrated outstanding volunteer service over and beyond the requirements of their designated program. Our Coordinated Service Team, composed of Brittany Ledbetter, Jessica Callahan and Jacob Buck received the Martin Luther King Jr. Day of Service Award, recognizing outstanding projects and volunteer engagement surrounding the Martin Luther King Jr. Day of Service. “Whether it is the AmeriCorps members serving their communities, or the volunteers who donate their time throughout the year and on ‘Martin Luther King Jr. Day of Service,’ the Commission has had much success empowering individuals to ‘make a difference’ in Missouri communities,” Thompson said. MCSC is composed of 15-25 governor-appointed commissioners with expertise in areas of community service and volunteerism. Commissioners and staff work together to encourage all Missourians to give of themselves to make Missouri a better place to live for all of its residents. State-wide nominations for the awards are reviewed and selected by a panel of governor-appointed commissioners and commission staff.